First, the lunch... We are members of the Ozarks Area Beekeepers Association and I am also the club's newsletter editor. Today was the clubs annual spring outing and potluck. We started the day off with a quick trip to Lowes to pickup the kids "Build & Grow" projects. If you have not taken your child, grandchild, niece, nephew to Lowes' "Build & Grow Clinic", it is definitely worth checking out. The kids love it, they get to build something out of wood and it is a great bonding experience as well as confidence builder. They have it every other week and it is well worth the gas to build a free project and see the smile and satisfaction on your child face when they are done. After Lowes we headed out to the Brooks' farm where the beekeeping lunch was going on. When we arrive everyone was getting ready to eat lunch. So we arrive at the perfect time (in my opinion). :) Yum, the food was delicious, and there was more than enough to go around. If anyone questions the minimal dues paid to join the association, this lunch alone makes it worth every penny, but we also have a Christmas dinner too!! Now for the bees... Well after gorging ourselves on all the wonderful food, we headed out to Jack's bee yard. There were about 60 people in attendance this year and it was great to see everyone. Lots of good quesitons were asked and there was plenty of help for the new beekeepers. My wife got her first real bee experience. She was the phtographer for the occasion and some of the pictures she took are part of this post. Tracy has become a wonderful photographer and her pictures adorn the web site. About 95% of the pictures you see on the site are hers. It was amazing to see her work the camera around the bees. She was right in the middle of all the action, without a veil or bee suit I might add. Everyone kept commenting on, isn't she afraid of getting stung, or she is going to get stung... Something like that. Well I am proud to say that she didn't not even once, and she was within 2 feet of the hives some of the time. 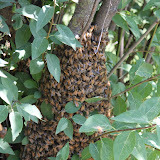 Lastly, the swarms... Well as luck would have it, this week has been very busy for bee swarm removal. We have had at least three calls for bee swarm removal this week alone. Jeff seems to think that it is due to the pressure changes from incoming storms and I would tend to agree. Just last night we had a storm move in and our bees were bearding heavily on the front of most of the hives. It is amazing almost like they want to watch the storm roll in. 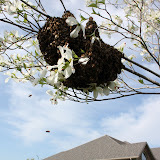 Well we had bee swarm removal calls in Greene county, and another bee swarm removal call in Christian county this week. It has been a great month for beekeeping in general, but we love saving the bees and getting the swarm removal calls is always fun. The useful creating capabilities usually are obvious in this posting. I'm sure the best element concerning this details is usually that it’s finish of amazing still details. The important points is usually top-notch.